Coldplay is a post-Britpop/alternative rock band from London, United Kingdom well known for their rock melodies and introspective lyrics. Coldplay's early material was reminiscent of artists such as Radiohead, Oasis, Jeff Buckley, and Travis. Other influences include U2, R.E.M, Pink Floyd, a-ha, John Lennon, The Smiths, Grandaddy, Sparklehorse, The Stone Roses, Tom Waits, The Flaming Lips, Neil Young, Echo and the Bunnymen and, more recently, Johnny Cash and Kraftwerk. Before his death, Cash was actually scheduled to record a track written by the band. Since the release of A Rush Of Blood To The Head, Coldplay has also been actively supporting various social and political causes. They have been advocates for Oxfam's Make Trade Fair campaign and Amnesty International. The group has also performed at various charity projects such as Band Aid 20, Live 8, and the Teenage Cancer Trust. Martin was outspoken against Iraq war in 2003, and endorsed Democratic presidential candidate John Kerry in 2004. Bassist Guy Berryman says, "You can make people aware of issues. It isn't very much effort for us at all, but if it can help people, then we want to do it". 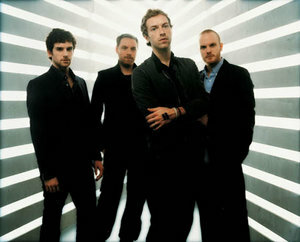 Despite Coldplay's surge in popularity, the band has remained very protective of how their music is used in the media. The band allows their music to be used in film, television, and promotional spots such as the movie trailer to Peter Pan. However, Coldplay has been adamantly against their use in actual product endorsement. The band turned down multi-million dollar contracts from Gatorade, Diet Coke and The Gap, who wanted to use the songs "Yellow", "Trouble", and "Don't Panic" respectively. According to Martin, "We wouldn't be able to live with ourselves if we sold the songs' meanings like that." June was a pivotal moment in Coldplay's history. The band embarked on their first headlining tour, which included a triumphant return to Glastonbury. More notably, the band released the breakthrough single "Yellow". The song shot to #4 on the UK Singles Chart and placed the band in public consciousness. Coldplay released their first full-length album, Parachutes in July 2000, which debuted at #1 on the UK Albums Chart. Along with critical acclaim, Parachutes was sometimes criticised for bearing a strong resemblance to the music of Radiohead in their The Bends - OK Computer era. "Yellow" and "Trouble" earned regular airplay on radio on both sides of the Atlantic. Parlophone originally predicted sales of 40,000 units of Parachutes; by Christmas 1.6 million copies had been sold in the United Kingdom alone. Parachutes was nominated for the Mercury Music Prize in September 2000. Having found success in Europe, the band set their sights on North America. Parachutes was released in November 2000. The band embarked on a US club tour in early 2001 coupled with appearances on Saturday Night Live, Late Night with Conan O'Brien and The Late Show with David Letterman. Parachutes was a modest success, and was certified with Gold status in the United States. The album was also critically well received, and Parachutes earned Best Alternative Music Album honours at the 2002 Grammy Awards. With much anticipation, Coldplay released their sophomore album, A Rush Of Blood To The Head in August 2002. The album was generally considered to be a more sophisticated effort than Parachutes. For example, the charged opening track "Politik" was written days after the September 11 terrorist attacks. A Rush Of Blood To The Head became a best-seller and earned the band more critical accolades. The album spawned many popular singles, notably "In My Place", "The Scientist", and "Clocks". A Rush Of Blood To The Head was perhaps most reminiscent of classic era Echo and the Bunnymen. This is not surprising since Bunnymen singer Ian McCulloch was invited to recording sessions as an unofficial studio consultant. On one occasion, Martin was actually wearing McCulloch's jacket when recording "In My Place". Chris Martin and Jon Buckland returned the favour by guesting on McCulloch's solo album Slideling. Coldplay also performed live renditions of the Bunnymen hit "Lips Like Sugar" on a regular basis. Coldplay toured for over a year from June 2002 to September 2003, visiting 5 continents including co-headlining festival dates at Glastonbury Festival, V2003, and Rock Werchter. The tour showed the band's progression into a bona fide stadium act. Many shows included elaborate lighting and individualized screens reminiscent of the U2 Elevation Tour. Coldplay also built a reputation of performing eclectic covers, including Aqua's "Barbie Girl", Rammstein's "Du Hast", and Nelly's "Hot in Herre", along with more heartfelt renditions of a-ha's "The Living Daylights" and Louis Armstrong's "What a Wonderful World". During the extended tour, Coldplay also recorded a live DVD and CD, Live 2003, at Sydney's Horden Pavilion. A new song, "Moses", could be found on this compilation. 2004 was a quiet year for Coldplay, as they spent most of the year out of spotlight resting from touring and recording their third album. In May, Coldplay teased fans with a new song and music video on their official site to celebrate the birth of Martin's daughter, Apple. Famed producer Sir George Martin introduced the promo as Coldplay and their producer Ken Nelson performed as The Nappies, a satirised rap/glam rock outfit. Martin joked that this music had been inspired by Jay-Z. Coldplay's third album, X&Y was released on the 6th June 2005 in the UK. The lead single "Speed of Sound", made its radio and online music store debut on the 18th April and was released as a CD on the 23rd May 2005. The album debuted at #1 in 28 countries worldwide and was the 2nd fastest selling album in UK chart history (behind the 1997 Oasis album Be Here Now). X&Y was originally set to be released in late 2004. In the middle of that year, Coldplay had penned over 40 new songs for their third album. Several of these songs such as "Ladder To The Sun", "World Turned Upside Down", and "Poor Me" had been performed live on the A Rush Of Blood To The Head Tour. However, they were scrapped and the band regrouped to write and record new tracks. X&Y was recorded over 18 months in 8 studios in New York City, Chicago, Los Angeles, Liverpool, and London. To promote the new release, Coldplay performed at a series of intimate secret gigs in Europe and in North America from March to May 2005, which resulted in sold-out shows in locations such as San Francisco, Chicago, Toronto, Boston and New York City. Coldplay is currently performing on a European tour through June and July; the band will be playing at 40 North American shows from August to late September during the Twisted Logic Tour. Summer 2005 also saw them headlining the Coachella, Glastonbury, and Fuji Rock festivals, as well as appearing at Live 8 in Hyde Park, London. Coldplay has planned a second leg of the Twisted Logic tour for 2006, with tentative North American dates from February to April. In an interview with the Chicago Sun-Times, Chris Martin hinted that Coldplay's next album may be a "fast, dark and heavy" affair "with no pianos." Band manager David Holmes suggested that the band may record a new album between their tour schedule over the new year.